Posted on this page is a news report from the Philippines about a legislative push for Talking ATMs in that country. Reading this news on the eve of the 20th anniversary of the Americans with Disabilities Act is fitting. Jump to news story. Although the law being celebrated this month is focused on “Americans”, disability advocacy in one part of the globe often has ripple affects across the world. This has been especially true for accessible technology. Today we have a global economy and multi-national corporations. We also have global advocacy and international advances in disability access. Talking ATMs are a great illustration of this phenomenon. The first Talking ATM in the United states was installed in San Francisco in 1999. Since that time, tens of thousands of Talking ATMs have been installed in this country, built primarily by a handful of international manufacturers. Those manufacturers — NCR, Diebold, Fujitsu, Triton, Wincor-Nixdorf among the leaders — produce and distribute ATMs worldwide. 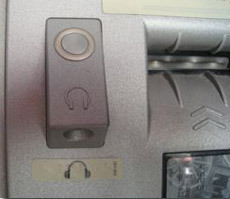 As talking functionality became standard in these machines in the U.S., Talking ATMs became available in other parts of the world. Strong advocacy by the blind community and willing collaboration by the banking industry in the United States were fundamental to the spread of Talking ATMs across the globe. But equally important was the law whose birthday we celebrate on July 26, 2010. The Americans with Disabilities Act contains flexible language recognizing the need for “auxiliary aids and services” to ensure integration of blind people into all aspects of society. In the initial regulations adopted to implement the ADA, the U.S. Department of Justice mandated that ATMs be “independently usable” by people with visual impairments. The world-wide spread of Talking ATMs flowed from the ADA and the ADA regulations. Since I began tracking these issues in the early 2000’s, Google alerts have let me know about Talking ATMs in India, Pakistan, Australia, England, Ireland, Switzerland, New Zealand and elsewhere. Here is today’s Talking ATM news from the Philippines. To save you the trip to a dictionary that I had to make, the word “solon” in the headline means legislator. Quezon, Philippines (July 22, 2010)– A Pro-administration legislator has pushed for the immediate approval of a bill for the setting up of automated teller machines (ATMs) for visually impaired people. The ATM for the blind, according to Liberal Party Rep. Lorenzo Tañada III of Quezon, author of House Bill 221, or the “ATM Access for the Visually Impaired Act,” will provide the visually impaired access to the machine through an auditory system of conveying and receiving information. In filing the bill, Tañada said differently abled persons should, as much as possible, be afforded opportunities to overcome their disability and remain fully integrated with society. “By giving them access to this technology, not only their financial transactions but their integration into mainstream society be greatly facilitated,” Tañada said. He said one of the concrete ways in which this can be done is by allowing them to manage their finances and conduct financial transactions without external aid. As embodied in the bill, all banking institutions shall provide ATM machines that shall be equipped to conduct transactions by means of an audio transmission system. It said all audible information is delivered privately through a standard headphone jack on the face of the machine or a separately attached telephone handset. Information is delivered to the customer either through prerecorded sound files or via text-to-speech synthesis. During the 14th Congress, a similar bill was filed seeking to provide nonvisual method for reading or relaying the sequence of messages that appear on the screen of ATMs. It said that as technology increases, more and more people rely on ATMs as a method of doing daily banking tasks. “While many ATMs currently have Braille labels indicating the functions of some buttons, most machines do not have any non-visual method of reading or relaying the sequence of messages that appear on the screen,” it said. This post is about Talking ATMs in the Philippines. A legislator in that country is trying to pass a law requiring Talking ATMs so blind people can use ATMs. ATM advocacy started in the United States because of the Americans with Disabilities Act. Back to news story.